Tibetan Terrier dog breed originated in Tibet. Tibetan Terrier known as the "Holy Dogs of Tibet", they were never sold but only given as gifts by monks to promote good fortune. Since the dog was considered a bringer of luck, mistreating or selling a Tibetan Terrier was believed to cause bad luck to both family and village. 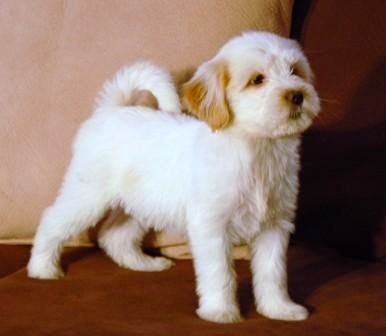 The Tibetan Terrier is a powerful, medium sized dog of square proportions, with a shaggy coat. The head is moderate, with a strong muzzle of medium length, and a skull neither rounded nor flat. The eyes are large, dark, and set fairly far apart. The V-shaped drop ears are well feathered, and should be set high on the sides of the skull. The length of the back should be equal to the height at the withers, giving the breed its typical square look. The tail is set high, well feathered, and carried in a curl over the back. One of the more unusual features of the Tibetan Terrier is the broad, flat feet with hair between the toes. They are ideal for climbing mountains and act as natural snow shoes. The double coat is profuse, with a warm undercoat and a topcoat which has the texture of human hair. It should not be silky or curled. A fall of hair covers the face and eyes, but long eyelashes generally prevent hair from getting in the Tibetan Terrier's eyes, and the breed has very good eyesight. The temperament has been one of the most attractive aspects of the breed. They are amiable and affectionate family dogs, sensitive to their owners and gentle with older children. Tibetan Terriers are usually charming and loyal. 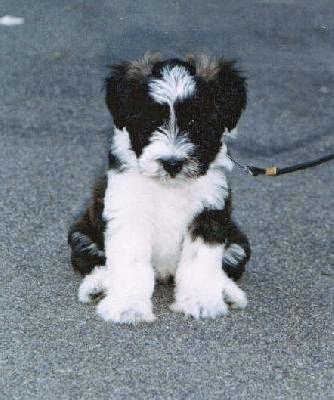 The average lifespan of Tibetan Terrier is 12 years. Tibetan Terriers were not sold, but given sometimes as gifts. 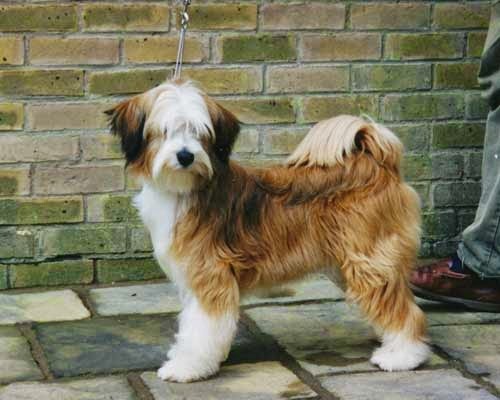 The Tibetan Terrier is not a true terrier, thought it somewhat resembles one in size and appearance. Though the Tibetan Terrier has roots in herding, the breed is mainly known as a companion dog and is therefore a member of the non-sporting group. 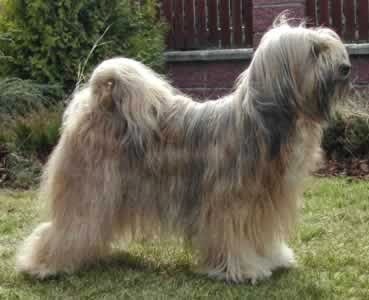 The Tibetan Terrier is a very old breed, almost 2000 years ago they were bred and raised in the monasteries by lamas. The Tibetan people believe in reincarnation therefore the Tibetan Terriers were known as "Holy Dogs" and "Luck Bringers". They were never sold but presented to visiting lamas to safeguard them on their journey home and to bring peace and prosperity to their own monastery. The Tibetan Terrier should be named Tibtan Apso, because he is a herders dog and absolutely no Terrier blood is running in it´s veins. The Tibetan Terrier loves long walks. But his most favorite thing is, to play with other dogs. It is a great pleasure to watch its lovely movements. Tibetan Terriers can climb very well and they are good companions for walks in the mountains. 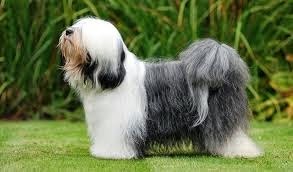 One of the qualitys is that a Tibetan Terrier can use its paws like cats.